Length: 31" (~787mm) with motor and prop. Power: Two BP/Suppo/no-name 2208-12 motors each with a 30A ESC, 3S 2100mAh 20C, Counter-rotating 7x5 props trimmed-down to 6x5. All this generates about 280W according to the WattsUp. Paint Scheme: Inspired from a German ME-109 I built as a kid. Paint Used: Delta Ceramcoat Acrylic Craft Paint from Hobby Lobby ($1ea). Finished off with several coats of Minwax Semi-Gloss Polycrylic spray (blue can). Decals: Images found on the intarweb. I printed them on CD/DVD labels with my inkjet, cut them out, and stuck them on before the clear-coating. Thrust Vectoring: Accomplished via four custom mixes in my DX7 (Flap and Gear Channels). Tx Programming: As one might expect, she's can be pretty touchy. I use 50% expo on ELEV and 40% on AILE with 100% full throws. The canards are mixed to ELEV at 35%. All the trust-vectoring mixes are 47% to both ELEV and AILE. CG: I highly recommend that you start at the 10.5CM mark and work your way forward to taste from there. When all was said and done, I had to add 1.5oz of lead to the nose to get my CG where I wanted it. Believe me when I tell you that you do not want this bird to be tail-heavy. Lessons learned from the X-41: New CF spar layout. There won't be any wing-flapping here! New, cheaper, easier, and simpler version of the canard control system. It consists of CF rod, two pieces of ply, two plastic disks, and a servo control horn. Shown here after assembly. 5min epoxy was used. A different view of the new canard control system. I use two pieces of 3/4 hardwood flooring to place on either side of the fuse while gluing the canards onto the CF. This assures that both canards will be parallel. Basic airframe nearing completion. Engine nacelles are just pinned-on for test fitting. The original idea in card-stock. "Bob's Amazing Thrust-Vectoring Motor Mount"
Material is .028"x1" stainless steel strip I picked-up at my LHS. Cut with tin-snips, then ground down with a dremel grinding stone. Note the spacers between motor and mount so the shaft and C clip doesn't bind. Another angle... The final mounting used a 4-40 bolt, two nylon washers between the mount and the stick, and a 4-40 nylock nut. Motor mount sticks with reinforcements on each side. I just can't have all those electronics exposed. Front of the bottom "cover"
I had big CG problems, so the canard servo had to move so I can get the battery further forward. Finishing up the ESC wiring. I had to add 1.5oz of lead to the nose to get the CG correct. Here, the top of the fuse is being glued. Last edited by T3chDad; Feb 26, 2012 at 01:13 PM. You may notice the somewhat jet-like sound to this plane. This is thanks to toy whistles installed on the wingtips. I liken this to putting baseball cards on my bicycle spokes as a kid or the kids putting those silly noise mufflers on their Civics. I always gets a good laugh at the field. Here are the whistles. There is a pair of these on each wingtip. The whistles snap together from each side of the foam through a small rectangular cut in the foam. This is where the whistles came from. A friend of mine picked them up from a local drug store (CVS) and was nice enough to part with them. Thanks again Jim! It's a wonder what being home from work sick for a week can do for the appearance of an aircraft! 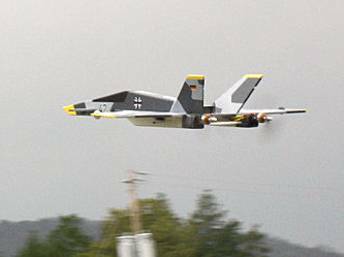 X-42 Coming in for a landing. The original X-41. For more information visit the X-41 thread linked above. Last edited by T3chDad; Apr 05, 2008 at 10:19 AM. I just didn't panic like the previous time I crashed. I kept my wits and was able to recover. ...but I thought it was a good demonstration of what the TV could do. Thanks for all the complements! Seriously, this is one of my favorites. Delta, canard, twin VT its got all the best stuff! Oh well...twenty three flights...and two crashes now. The flight was going awesome. I was trying some new things and using more throttle in this flight. One of the ESCs went to LVC before the other, and I was too low and I realized what was happening too late. I cut the throttle, and she went straight in. I'm liking depron more and more. There was hardly any damage. What is broken is broken clean and should be easily repaired. She should be back in the air tomorrow. I did take 1 minute off my timer...I had 22 seconds left when this happened. Last edited by T3chDad; Apr 02, 2008 at 04:10 PM. Sorry I missed seeing it. I was at the Parade Grounds about 11:30 today and had the whole soggy field to myself! Sorry I missed you Jim. I could have killed the weather men/sites yesterday. They were claiming high winds and 90% thunderstorms and rain so Jeff and I didn't bring anything to fly. I had to look out the window at the beautiful weather and limp heli pad wind-sock all day. Anyway, she's all fixed up and ready to fly again. Hopefully the winds will die-down before lunch. Thanks, again to everyone for the complements, I'm glad you like it. Last edited by T3chDad; Apr 02, 2008 at 10:39 PM. The TV is an awesome idea. 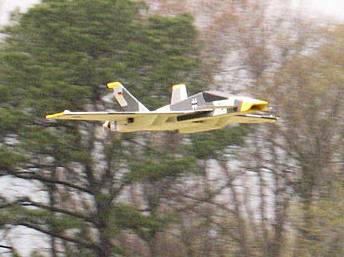 I think I am going to try a scaled down version with TV but only as a X-41. I need to get one of these in my fleet. One question though: How did you get the bends on the stainless so neat and clean? What did you use to bend it? Bending: For the longest bend (side with pushrod hole) I clamped it in my bench vise and hammered it over to 90deg. The shorter bend was accomplished with some large needle-nose pliers and some electricians pliers. This stainless was not difficult to bend at all and I don't see any reason you couldn't use two pair of pliers for both bends. I was just being picky. Drilling: Don't drill the holes for the stick mount until the bends are complete. I suggest you place some motor mount stick in the motor mount and drill through one side of the the mount, through the stick, and out the other side of the mount in order to get your orientation and alignment correct. Important Note: Remember, screw holes on the back of most motors are NOT arranged symmetrically. If you want to have mirrored orientation of the motors, the screw holes in the mounts for the motors will need to be different to account for this.